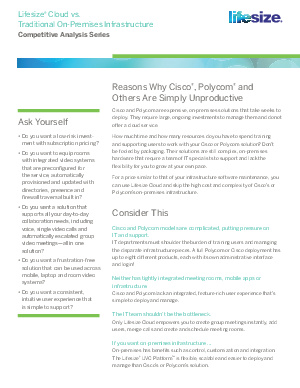 Cisco and Polycom are expensive, on-premises solutions that take weeks to deploy. They require large, ongoing investments to manage them and do not offer a cloud service. How much time and how many resources do you have to spend training and supporting users to work with your Cisco or Polycom solution? Don’t be fooled by packaging. Their solutions are still complex, on-premises hardware that require a team of IT specialists to support and lack the flexibility for you to grow at your own pace. For a price similar to that of your infrastructure software maintenance, you can use Lifesize Cloud and skip the high cost and complexity of Cisco’s or Polycom’s on-premises infrastructure.